Overview The Alaska, Chugach and Wrangell-Saint Elias mountain ranges converge into the "mountain kingdom of North America." This wilderness houses our continent's largest collection of glaciers, and the greatest combination 16,000+ feet peaks. 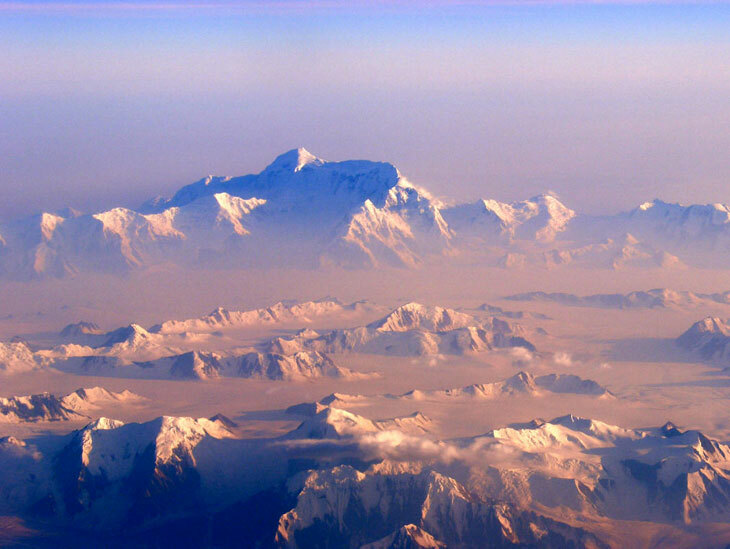 For many the most notable of these is the famous and popular Mount St. Elias at over 18,000 feet. This makes it the second highest peak in the America. Picture shows the landscape in early September along the Chitina River just off the main road here, the McCarthy Road. In the early part of the 20th century the McCarthy Road was used as a railway to support the copper mining business. It was abandoned in 1938 when large scale mining ended and gradually became the main tourist road and ranger road for exploration. You cannot travel the 50 miles one way in less than 4 hours unless you are willing to take a beating. The road is rough, with tons of holes and washouts. Hiking in Wrangell-St. Elias National Park & Preserve can be a very rewarding wild experience if you are prepared for the hazards of walking and sleeping in rugged, undeveloped land. Here, you will experience solitude, self-reliance, and nature that looks much the same way it has since this place came into existence. There are very few real trails in the park, so expect to hike through dense bushes, along steep rocky slopes, and through fast flowing extremely cold glacial rivers. This is not a typical camping trip. You will NOT come home if you hike here and overnight without a map and actual legitimate and accurate compass reading skills. Weather here varies hourly and gets extreme real fast. You must prepare for all possible situations especially with the proper clothing choices. Buy layered sets in polypropylene or real wool. Unless you get exceptionally lucky you will need heavy duty rain gear too. Bring lots of food and something to purify the water with. Picture shows person snow machining in Wrangell St. Elias National Park and Preserve. 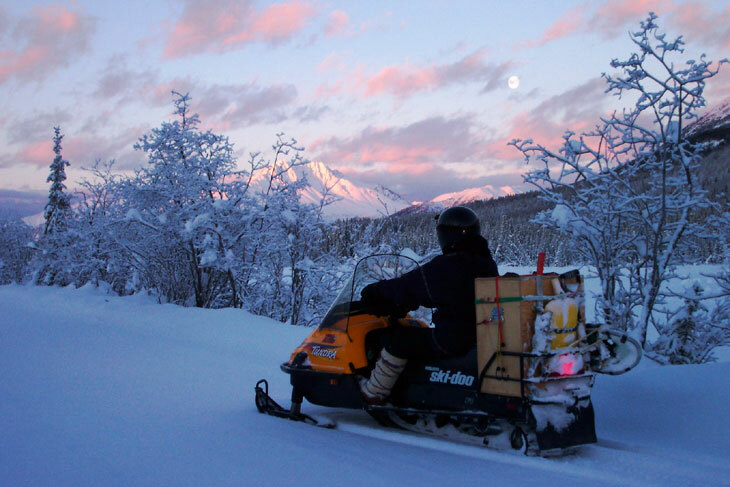 Other than sled dogs there really aren't many other ways to get around than this in Alaska. Trip Planning - A hiking trip here requires adequate planning. You should be prepared for everything from heavy storms and a broken leg, to screaming biting insects and a bear attack. Rescue from outsiders is unlikely. Since you will be on your own here caution and good judgment become extremely important. Lots of hikers use local guides. You can ask them to come with you and camp 200 feet away each night when you want privacy. The areas above 3,000 feet have the best hiking views. You get here by chartering a flight to one of the "bush plane" landing strips. Picture shows campers along the Nabesna River. The Nabesna River and the Chisana River combine to form the Tanana River. The Tanana flows into the Yukon River and finally to the Bering Sea. This entire route can be quite challenging and full of photographic opportunities especially pertaining to wild life. 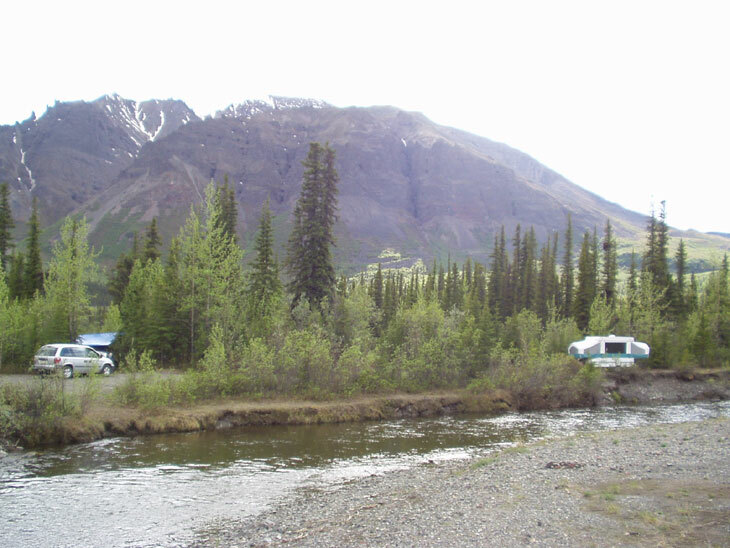 River Rafting - The rivers of Wrangell-St. Elias National Park and Preserve offer visitors adventure and chance to be almost completely alone for long period of time. It is easy to travel for 2-3 days and not see one single person, machine, trailhead, or constructed building like an outhouse or bridge. Picture of the summit of Mt. Elias. The coastal mountains in the St. Elias Range of Wrangell-St. Elias National Park and Preserve, topped by 18,008' Mt. 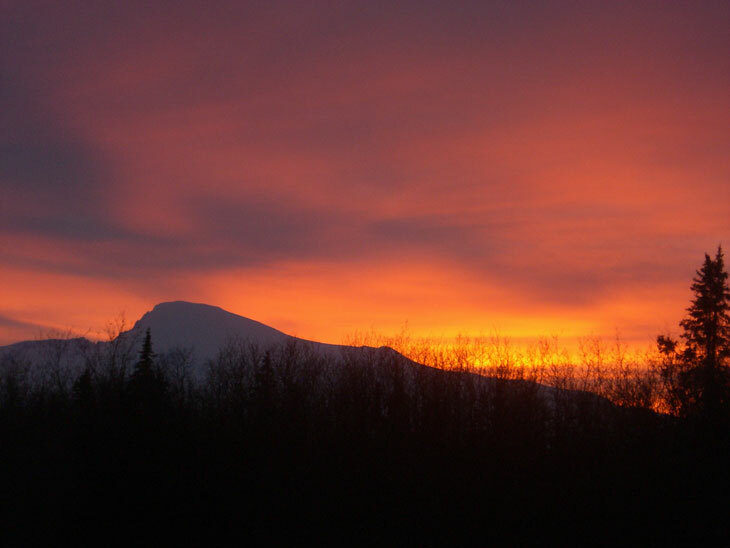 St. Elias, are among the least visited mountains of their elevation in North America. It is just too hard to get here. 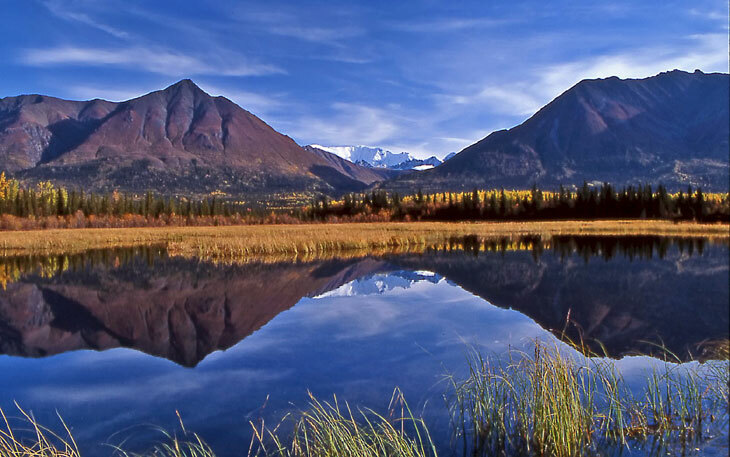 Sport Hunting - Wrangell St. Elias National Park represents 13 million acres of public land in south-central Alaska. You can Vanabode here forever for free. When the park and preserve were established by the U.S. Congress in 1980, certain forms of hunting and trapping were authorized for each type of area so check with local authorities if you want to hunt or take game. The National Park Service and the State of Alaska together manage the wildlife resources here and it takes both to even make a dent on what could happen. This place is gigantic. An Alaska State hunting license is required for all hunters age 16 or older and it is enforced with fines. Bag possession limits vary by species, time of year, and by which area of the park you are in. Picture taken at sunset at Mount Sanford which is 16,000+ feet above Copper River Valley. Vanabode Special Notes: Even though Alaska is extraordinary and Vanabode normally offers the absolute safest, easiest, cheapest, and fastest way to get around, I cannot recommend this destination. It is rugged and wild and so far from what I am familiar with. The inclement weather can be devastating and people die here in the winter from cold related accidents every year. If you do travel here do so when it is warmest. Plan ahead very very carefully. Alaska's extreme temperature swings, rain and bugs make this a priority in Wrangell St Elias National Park & Preserve Alaska.